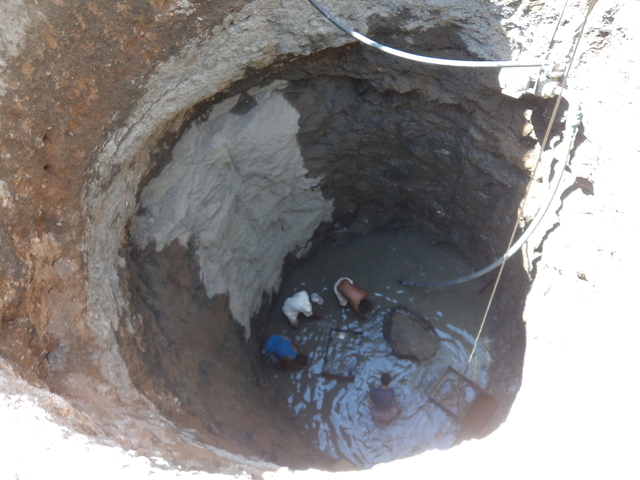 - the excavation work of the drinking water was initiated in December 2013. - The diameter of the well is 16 ft. and before the initiation of the well work the total depth was 15 ft. The inner side of 1.5 ft. length excavation of the well was completed up to 8 ft. from the top of the well for the construction of the well. 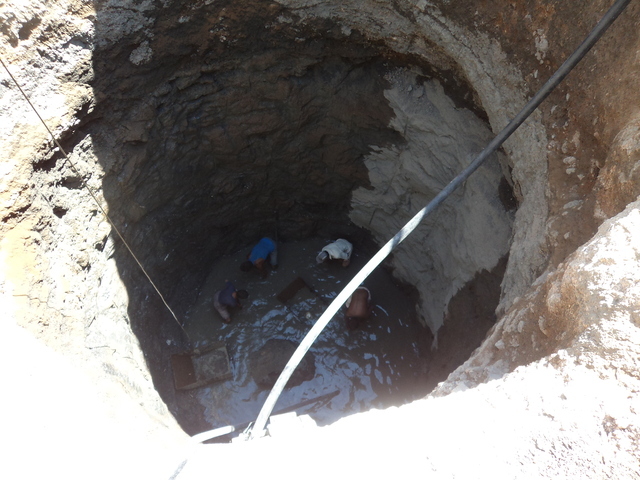 - The excavation of the well has been completed in hard rock up to 35 ft. depth from the top of the well. 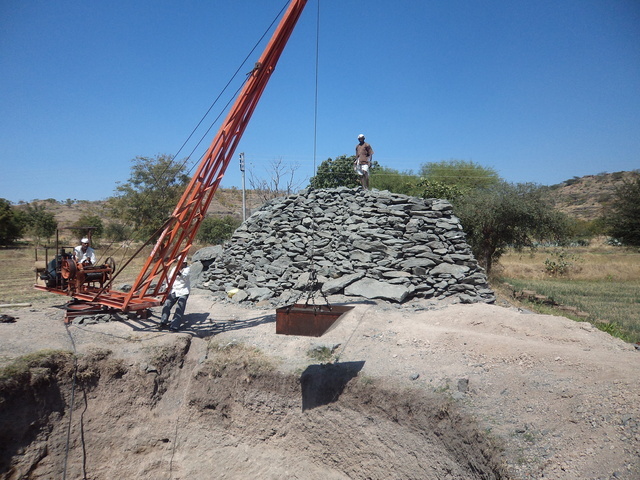 This was done through blasting machine and the excavated material from the well (stones, debris etc) has been lifted through the machine operated crane. The labor work was done by the target group as free labor equivalent to 20% of the total cost towards their own contribution. - The excavation of well is in progress and the total depth of the well will be 45 ft. deep from the top. - The water level in the well is about 4 to 4.5 ft. which is sufficient to serve the drinking water purpose in the summer months. - The construction work of the well will be initiated immediately after the completion of the deepening of the well. 1. In the original proposal the bore well of 200 feet was proposed to be drilled for source of drinking water. 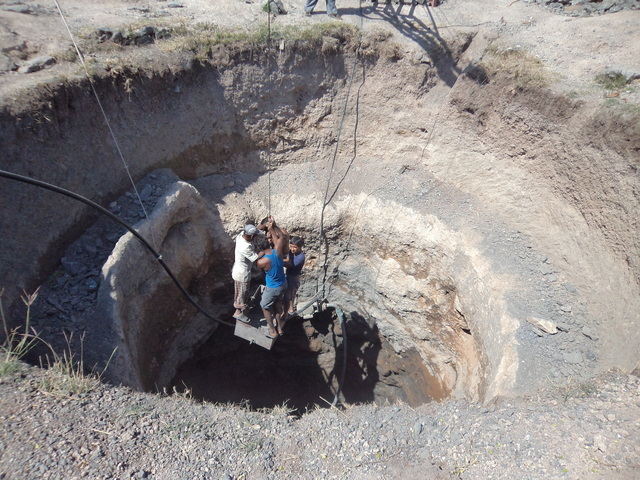 Before the initiation of drilling bore-well, the Geologist visited the site and opined that the bore-well would yield insufficient water in summer and would not meet the drinking water requirements of the community. It was suggested to excavate the existing private irrigation well by 20 feet deep, which would have more water storage capacity and the water would be sufficient throughout the year. 2. Hence, the plan was revised and by excavating the existing irrigation well by 20 feet more . Presently the well depth is 21 feet. The underground pipeline of 640 feet in length will be laid down and the water will be lifted from the existing irrigation well instead of the bore well. 3. The legal compliance such as Memorandum of Understanding among the well owner and Water Committee has been executed to that effect. 4. The bank account of the Water Committee is opened in the State Bank of India, branch Sakur. The people’s contribution of Rs. 30,000 has been collected and deposited in the bank. The rest of the people’s contribution will be generated in kind through voluntary labour. 5. The contract of blasting required for the excavation as well as for removal of the debris and other material from the well through crane (with machine) has been given to the local contractor. 7. The expenditure will be done within the sanctioned limit/released amount by BPR. 8. The delay in the initiation of the work was due to the change in water source and delay in collection of people’s contribution. 1. 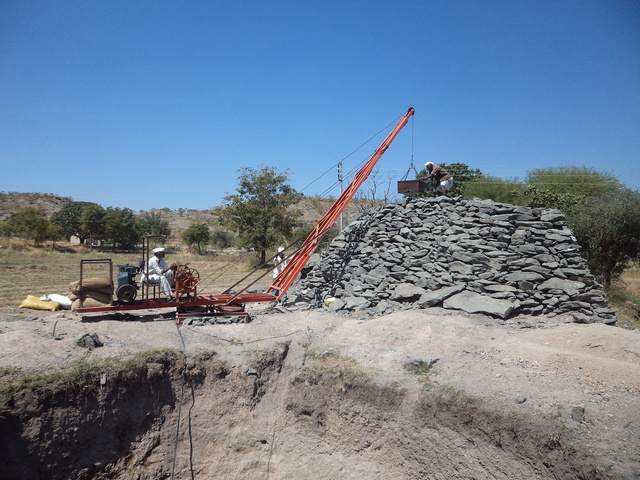 The construction of the well will be completed by end of January 2014. 4. Excavation of the existing well by end of April 2014 completion of the project by 30th April 2014.